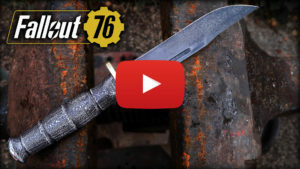 Making a real Combat Knife as seen in the Fallout 76 videogame. As soon as I have seen and used this knife in the game I knew I had to make a real one. So I decided to challenge myself and make the handle out of cast aluminum. This required to model the entire knife (that was the first step, had to change the order to make a better video) in Fusion360. Doing this I had all templates and patterns to make a proper two part mold out of petrobond sand. Of course the blade and guard needed to fit perfectly on the pattern to make it work so I really took my time to make them as close to reference as possible. Overall a really nice and fun project!